The sterling art deco spoon depicts a cutout version of a strange winged monster in the finial which is identified as "THE PIASA BIRD". The front of the handle is embossed "Alton Ill (Illinois)". The spoon is tea sized and has a manufacturer mark which I have not been able to identify. The back of the spoon is engraved with the name "L.P.Class" in script and the year "1915". The Piasa bird (pronouced p-ah-saw) is an old Illini indian legend which appears to have undergone changes over the years. Apparently when Marquette and Joliet were exploring the area, they noted a painted monster on a limestone bluff about 50 feet above the confluence of the Illinois and Mississippi river where the city of Alton is currently located. In their 1673 journal they described the painting as "each was as large as a calf with horns like a deer, red eyes, a beard like a tiger’s, a face like a man, the body covered with green, red and black scales, and a tail so long that it passed around the body, over the head and between the legs, ending like a fishes’ tail." They also drew a picture of the monster. According to the Illini indian legend, the people of the village were under constant attack by this great bird which swooped down and grabbed even full grown adults and carried them away to a bluff where they became his dinner. The great chief, Ouatoga, had a dream where he hid 20 of his braves (some versions have 6 or 8 braves) in a circle. He then positioned himself as the birds next victim. Just before sunset, the bird swooped down and grabbed the chief in its great talons. The Chief held resolutely to some roots and his men jumped out of their hiding place and shot poisoned arrows into the birds unprotected underbelly. The bird fell to its death. Chief Ouatoga was nursed back to health. "The picture was cut into the rock a half inch or more, and was originally painted red, black, and blue. It had the head of a bear, large disproportioned teeth, the horns of an elk, the scaly body of a large fish, and a bear's legs ending with eagle's claws. The tail was at least fifty feet long, wound three times around the body, and tipped with a spearhead thrust backward through its hind legs. "The upper horns were painted red, the lower portion and head were painted black. The wings expanded to the right and left of its head, and the Piasa's body was at least sixteen feet long. Its head and neck were covered with a whiskery mane, and its body...covered with the three colours... In 1820, Captain Gideon Spencer came up the Mississippi River and saw the same picture on the rock. He asked the nearby Indians what it was. They told him it was the Stormbird or Thunderer, and that it had been carved there by an Indian tribe long ago." "The current 48-by-22 foot painting situated on a 100-by-75 section of the Mississippi bluffs just north of Alton (1 mile up the Great River Road from the Alton Visitor's Center) was completed by the American Legends Society and volunteers in 1998." In 1836, "John Russell of Bluffdale, Ill., a 19th-century writer of frontier romance and adventure wrote: "The Piasa: An Indian Tradition of Illinois" [which] was published in the August 1836 issue of The Family Magazine, or Monthly Abstract of General Knowledge. The work purported to be the retelling of an Illini tribe legend, although scholars have long noted that Russell later admitted to his son that the story was simply fiction that had been inspired by the account of those eerie bluff paintings seen by Marquette and Jolliet." Russell in 1847 wrote another article about the piasa bird which had different details and in 1848 he wrote a third article which changed some of the details. Note: fossils of prehistoric flying reptiles have been discovered in the general area. Also note that the picture by Marquette did NOT show wings whereas the modern picture and spoon do show wings. However, the legend is so firmly established in the region that the detail differences are no longer material. Of course, scientists tell us that dinosaurs and humans did not co-exist at any time in history, but there are enough legends of dragons and strange creatures around to indicate that it is somewhat possible that a few of these reptiles did co-exist with early man. I suspect that the vast majority of these creatures died out millions of years before man emerged, but I would not doubt the ability of a few of these monsters to have survived in remote areas under the right circumstances. Note: as this article was waiting for publication, Chinese scientists published information about a new ‘prehistoric’ dinosaur bird. 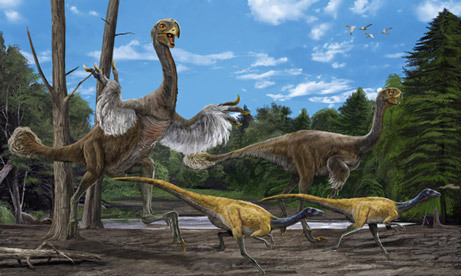 They describe the bird as “At up to 16 feet tall and 26 feet long, Gigantoraptor dwarfed its relatives, a group of small, feathered theropods called Oviraptorosaurs. The hefty dinosaur weighed 35 times more than other Oviraptorosaurs.” I have no evidence which would allow me to indicate that the Piasa bird is related to this new skeletal discovery. A National Geographic artist rendition of this new creature is included in this article. After I wrote this article, new facts were published about a similar bird in New Zealand's Maori Legend. A giant man-eating bird that appears in ancient Maori legends did actually exist, according to new research. The Te Hokioi was described as a huge black-and-white predator with a red crest and yellow-green tinged wingtips, in an account given to Sir George Gray, an early governor of New Zealand. Scientists now think the stories handed down by word of mouth and depicted in rock drawings refer to Haast's eagle, a raptor that became extinct just 500 years ago. Haast's eagle (Harpagornis moorei) was discovered in swamp deposits by Sir Julius von Haast in the 1870s, the Independent reports. It was at first thought to be a scavenger because its bill was similar to a vulture's with hoods over its nostrils to stop flesh blocking its air passages as it rooted around inside carcasses. But a re-examination of skeletons using modern technology, including CAT scans, by researchers at Canterbury Museum in Christchurch and the University of New South Wales in Australia showed it had a strong enough pelvis to deliver a deadly blow as it dived at speeds of up to 80kph. The bird has a wingspan of up to three metres and weighed 18kg. It was twice the size of the largest living eagle and its talons were as big as a tiger's claws.